The DMAIC methodology represents the phases of a process management process, especially in the Six Sigma environment. Here the processes are modeled in such way that they keep stable a given Six Sigma level of performance. 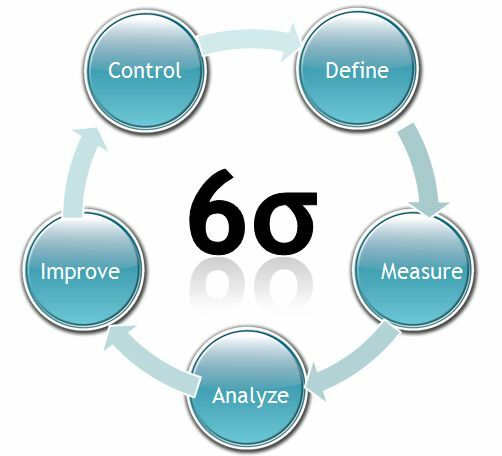 Measurements in Six Sigma are performed based on DMAIC. On a more abstract level, the DMAIC implements the idea of continuous process improvements. Processes are constantly monitored for possible improvement possibilities. If such opportunities are identified, improvement scenarios are evaluated and a concrete improvement is implemented. As the performance of the process is constantly monitored, the effects of an improvement become visible and further adjustments can be taken. This concept is known in system theory as feedback cycle. The main benefit of DMAIC is that it contributes to the creation of a conceptual framework for consistent performance measurement, improvement, and control. DMAIC is an abbreviation for these five phases of the DMAIC project methodology. Definition of the process improvement goals, which are consistent with customer requirements and corporate strategy. Measuring of the current process and gathering of relevant data for subsequent comparison. Determination of the causal relationships within the process. Determine what kind of relationship is involved and make sure that all factors have been considered. Improve or optimize the process based on the analysis, using techniques such as Design of Experiments. Continuously monitor the process as it continues using the measuring systems developed. Set up appropriate corrective actions for anticipated deviations in the process. The achievement of maximum customer satisfaction at minimum cost is the goal of this method. This methodology is not only a means of ensuring and improving quality, but it is also a strategic initiative that combines the interests of the stakeholders "customer" and "enterprise" by increasing customer satisfaction and company profits. With ARIS Six Sigma, Software AG offers a product that supports the entire DMAIC cycle. The article "ARIS loves Six Sigma" describes in detail how ARIS supports the individual phases of the DMAIC cycle. 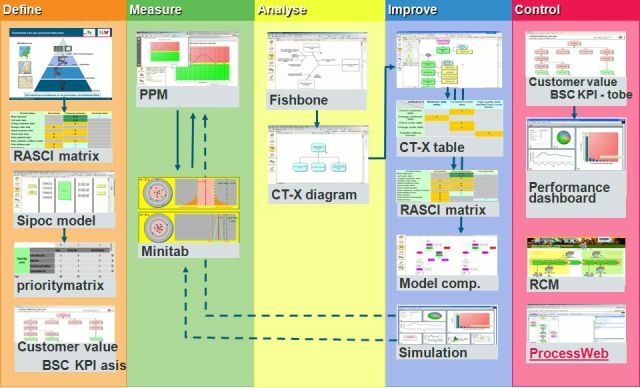 Use the free modeling tool ARIS Express to capture your current processes and to evaluate possible improvement scenarios. Get your free license key for the KPI dashboard solution ARIS MashZone to visualise the most important process KPIs. Both free offerings allow you to take a first step in implementing the DMAIC in your company.